Her parents defied society to marry for love and that is what Elin Morris has always dreamed of for herself. She thought she had found that love when she was sixteen but Ben left to join the military without even a farewell and she hasn't seen him since. Now, seven years later, Elin is on the threshold of honoring the betrothal agreement made by her parents and their good friends when she was born - an agreement that will see her married to Gavin Whitridge, Duke of Baynton, oldest brother of the man to whom she, seven years earlier, gave both her heart and her virginity. Ben Whitridge did not leave Elin willingly. Nor was joining the military his decision but it's been a good life for him and one he loves...until his brother, the duke, uses his influence to end Ben's military service and bring him home. Angry, betrayed and with no direction now that his career has been taken from him, the last thing Ben needs is a front row seat to his brother's courtship of the only woman Ben has ever loved. Gavin Baynton has never once considered marrying for love. As Duke of Baynton, he knows his duty and will abide by it. For him, emotion holds no sway. Elin will be a good wife for him. She is lovely, well-spoken, a good political asset. Maybe, someday, love will follow but even if it does not, they will be a good match. His brother may think he loves Elin but she belongs to Gavin now and he is not about to give her up. I devoured this newest story from Cathy Maxwell. I knew who I wanted Elin to end up with from the beginning but there were so many twists and turns throughout that I didn't know how everything would turn out until almost the very end. It's a complicated journey and Maxwell sure doesn't make things easy for her characters. This is a happy ending that requires hard work, sacrifice, and compromise but it's oh, so worth it in the end. I especially enjoyed the family dynamics in this book. It wasn't only a romantic journey of one couple but also the journeys of individuals as well as families. Elin, Ben, and Gavin all had to evolve and grow as individuals in order for relationships to be mended and love to win the day. The scene where Gavin steps aside, and his reasons for doing so, are especially poignant. Gavin could have easily become the villain of this story and it's to Maxwell's credit that he did not. At the beginning of the book, he is black and white but as the story progresses, more layers of his character are revealed, not only to readers but to Gavin as well. I can't wait to tag along on the rest of his journey. 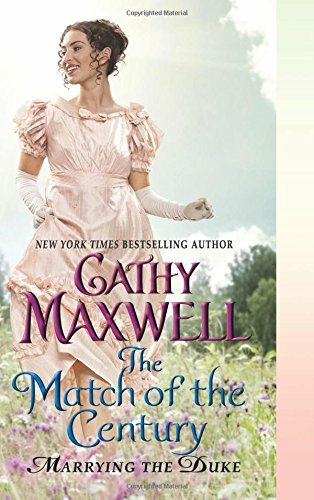 I recently asked Cathy Maxwell a few questions about her new series and the first book, The Match of the Century. Welcome, Cathy! Your newest historical romance, The Match of the Century was released last week. Please tell our readers what they can expect from this book and from your new Marrying the Duke series. I found myself wondering why is it that we hear of fabulously wealthy people with all the privileges being unhappy. The romance reader in me knows that love is the only true measure of a well-lived life but how does one discover that truth for himself? I am also a fan for “the one that got away” stories. I want that happy ending. Enter Gavin Whitridge, Duke of Baynton and his two brothers. Gavin lives for duty, for the “shoulds” that keep so many of on the narrow road. His brothers are his counterpoint—rebellious and independent of spirit. In many ways, these three books are Gavin’s journey toward love. However, his brothers have more than a few lessons to learn as well. What is the obstacle standing in the way of Ben and Elin’s happy ending? Making the right choices for them, while taking into account what matters for others—and isn’t that what stands in the way for most of us? On some very important decisions there is a battle between what should be done and what speaks to our hearts, our souls. I like honor and loyalty but they can become tripping points. I’m intrigued by both Ben and Gavin and can’t wait to find out what happened to their missing brother, Jack. Will each of the three brothers have his own book? Do they have release dates yet? Would I leave you guessing? I hope not. Let’s see—Jack’s story, FAIREST OF THEM ALL will hit bookshelves and e-readers April 28, 2016. A DATE AT THE ALTAR is scheduled for, I believe, December 2016 but don’t hold me to that date. I’m always the last to know! Everywhere I look, people are posting their Best of 2015 book lists. What are some of your favorite books that you’ve read this year? Lorraine Heath’s FALLING FOR THE DUKE; Geri Krotow’s NAVY RESCUE; Kristan Higgins’s IF YOU ONLY KNEW—great reads! A new discovery for me was Claudia Connor and WORTH THE FALL. Oh, yes, and Anna Richland. She has a great novella HIS ROAD HOME that won the Rita. After reading it, I downloaded her first Immortal Viking book, FIRST TO BURN. I’m not a paranormal fan but this one pulled me in. I love a good war hero. Today is the official kick-off of my Christmas baking season. Are you a Christmas baker? Do you have a favorite recipe to share? I don’t make New Year’s resolutions but I do set goals at the beginning of each year. What are your goals for 2016? I prefer to choose a word to be my theme of the year. My word for 2016 is “thrive.” I want to be very happy and present right where I am. No worrying about the future or yearning for the past. Right here. This is where life happens. Thank you for visiting with us today! Would you like to add anything? Would you like to ask our readers a question? Of course! My question: if you had to choose one word for 2016, what would it be? 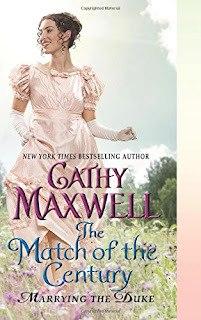 For more information about Cathy Maxwell and her books, visit her website and connect with her online at Facebook and Twitter. I love the excerpt. But then I've loved every book from Cathy Maxwell. Look forward to reading The Match of The Century.Don't get me started on that amazing cookie recipe, :) I'm going to give it a try. All my favorite flavors. Thank you for that.My word would be Positive. You will swoon with the first bite of those cookies. Plus, folks will think you labored for days, but even the salted caramel isn't that hard. Those cookies sound fabulous! I need to see if I can find a gluten-free cracker that's close to the club crackers. I have gluten-free graham cracker crumbs and the rest of the ingredients are okay. I so want to try this one! I love Cathy's books and really look forward to reading this new one. My word would be Patience. Patience is something I think we should all strive to achieve. Hope you enjoy Cathy's new book as much as I did! Cathy Maxwell's new novel has me quite intrigued and I'm certainly looking forward to reading it. I'm a big fan of Cathy's audio books. 'The Marriage Contract' and 'His Christmas Pleasure' are favorites.Delighted to see that 'Match of the Century' is available in the UK .... My Happy Christmas is assured! Wouldn't it be wonderful if everyone chose peace? These are all great words! Fresh is intriguing. I wake up fresh. I look at old ideas with a fresh eye . . . I *LOVED* this book! And then immediately went and pre-ordered the next one. (I got this copy as a review copy--and I read it in a day--which with a day job is still pretty good.) So good. I usually do word themes...and I've completely forgotten what my word for 2015 was. *LOL* Oops. I think if I have one for 2016, it needs to be something like FINISH IT ALREADY or something similar. I *LOVED* this book! And then immediately went and pre-ordered the next one. One year my theme was "Snap out of it!" Oh, Cathy! I love that! Hi Cathy! Thanks for being with us today. This was such a good book. I'm eagerly anticipating the next two. Can't wait to find out Jack's full story! My word for 2016 is REPLENISH. I allowed myself to become a bit complacent this year. My goal for next year is to replenish my personal well creatively, physically, educationally, and spiritually. My word is "healthy." That means healthier diet, more exercise, more sleep, and just more attention to myself. I love your books and can't wait to read this series. Loved your interview and the recipe! My word would have been peace, but since someone already said that, I will choose forgive. Forgive is an essential word in my life; one learned at my grandmother's knee. My word is HOPE. That anything is possible every day! Congratulations on the new book. As for 2016, perhaps hopeful. My word is thoughtful. Congratulations and best wishes. Congratulations in the new release. Looks wonderful. My word is kind. We can never have too much kindness. My word for 2016 is "Cure". Thank you for the chance to win Cathy's new book. More wonderful words . . . and a story behind each one. Thanks for all the congrats on the new release! reduce - myself (I want to loose some weight) and the amount of 'Stuff' I have! Right there with you, Di. WooHoo! A Cathy Maxwell prize to add to my TBR array. Thought I had ordered this one, but apparently had not. Good luck to all who entered. Good luck to you, Donna! My word is appreciate. Those salted caramel bars sound wonderful but I would be the only one eating them. My word for 2016 would be Peace. I love your books and I can't wait to start this new series. I love it when an author takes a family and introduces us to them with a book each. And of course, everyone has a happy ending. congrats to Cathy on the new release! This looks and sounds awesome! I'd have to go with.... exciting :) each new year brings exciting possibilities. thanks for sharing! Cathy, the new book sounds so good! I enjoy your stories and the humor you add to the romance. My word would be remembrance. There will be many times of doing so this year with sadness, but I also hope joy. My dad passed away in late September, so know there will be many firsts without him. I do enjoy her books. My word for 2016 HOPE. I'm fairly recent on the Cathy's wagon and so far I love her books! And this new one sounds beautiful as well.